Horseshoe Resort offers an all-inclusive getaway in the mountains with some of Ontario’s finest ski slopes in the winter, and expansive golf courses, bike trails and beach lounging in the summer. From inflatable obstacle courses to dirt bike rides, frisbee golf to mini putt, mega zip line to cable wakeboarding, there are activities suitable for all ages. This past weekend, however, Horseshoe Resort was a beautiful venue for Alana and Will’s wedding day where they celebrated their relationship and new beginning atop the ski hill overlooking the entire park. Originally local to Simcoe County, Alana was excited to be married in her hometown, only a short distance away from the farm at which she rode horses years ago. She and Will travelled from their home in the maritimes for the special affair, and many of their guests also had quite a journey with arrivals from across the country and beyond. The day began in the on-site hotel, which featured spacious rooms and glowing natural light (heaven!). 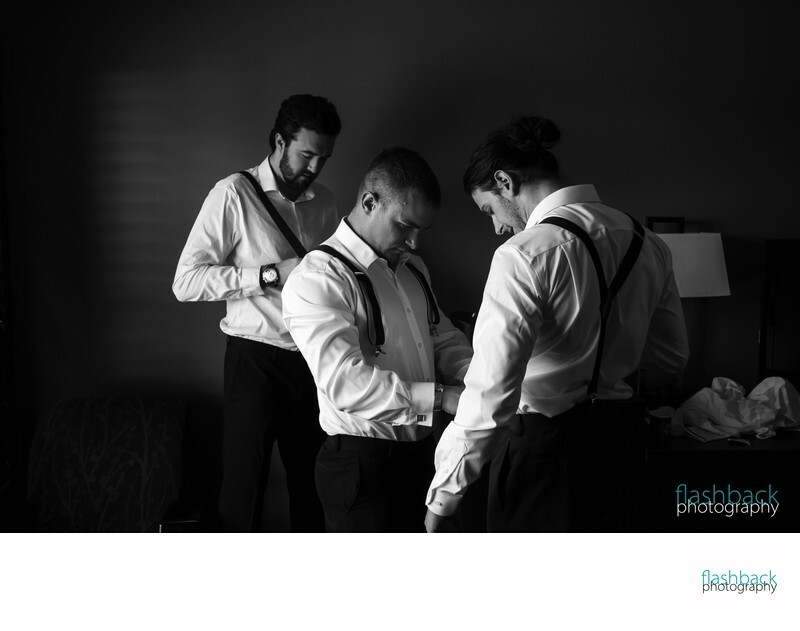 As Alana travelled from her hair salon in Barrie, I photographed the gentlemen donning their suspenders. This was a rare treat, as I do not often have the chance to work with the guys at this stage of the day. In many cases the bride and groom get ready at different locations, often 30 minutes apart, making it logistically impossible for me to visit both of them. In these cases I typically work with a second photographer to capture the gentlemen while I work with the ladies, however Alana and Will’s wedding was a wonderful exception!